On Friday, the Nats acquired Derek Norris, a catcher you may have heard of, from the Padres, for Pedro Avila, a 19-year old pitching prospect. It’s an interesting trade that could serve to solidify one of the two real position question marks for the Nats going in to next season, the other of course being wherever between CF and SS that Trea Turner doesn’t play. 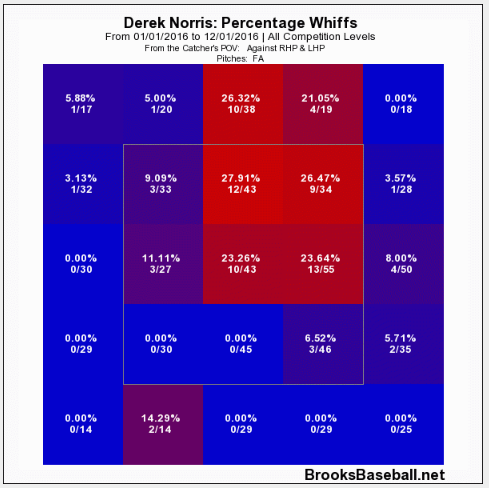 Norris is a fascinating pickup for a number of reasons, not the least of which is that he once a highly regarded prospect for the Nats, before being moved in the Gio Gonzalez trade. He also was an All Star in 2014 and a 3.0 bWAR player. BP gave him 3.3 WAR the following season, although was much less bullish about 2014. Acquiring him a year ago might would have been much more costly, prior to his 2016 season. He was, by some measures, the worst qualified hitter in MLB in 2016, with a .186 average and a sub-.600 OPS. 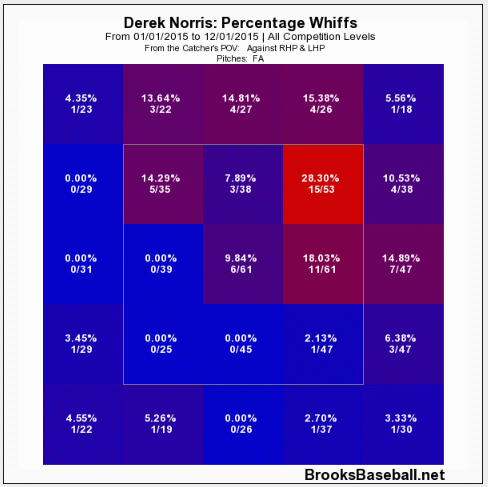 Is 2017 Derek Norris going to as bad of a hitter as 2016 Derek Norris was? Most likely not. His BABIP dropped from .313 over the three prior years to .238 in 2016. Some of that can probably be attributed to bad luck, although probably not all of it. 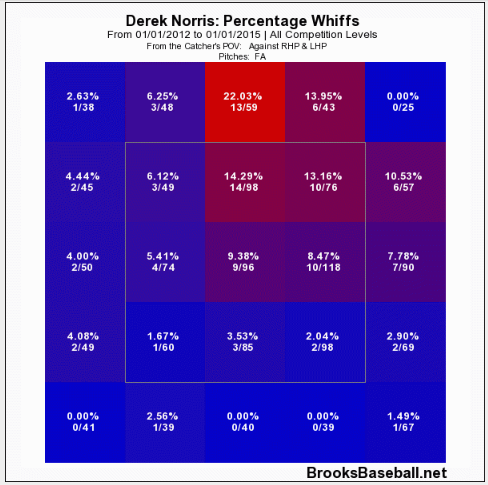 However, there are some downright troubling things about Norris as a hitter. Unlike the issues that Ryan Zimmerman has had, it’s not that Norris is hitting the ball hard, but just hitting it on the ground. Instead, Norris just didn’t hit the ball all that hard last season. Now he’s whiffing more high and away, than he did before – it’s not a good thing, but it’s 5 extra swings and misses on 20 less chances. Maybe something bad, maybe just noise. But, then we take a look at 2016. Total disaster. There’s no other way to frame it. He’s not catching up to strikes – and it’s not just those ones at the high part of the strike zone, it’s pitches down the middle. He didn’t catch up to fastballs above, what, thigh-level last year? And while 2015 was maybe an indicator, in hindsight, maybe, it wasn’t nearly this pronounced. Although you can’t really blame it on plate discipline, over the last two seasons he saw his on base percentage drop significantly. He also posted a career high K rate, at 30%, it was only 22% over the prior three seasons. His power has increased in that time, and leaving those west coast stadiums could get him to 20 HRs or more. Sure, that’s valuable if you’re looking to get a fantasy catcher, but Norris really needs to improve the OBP to help the Nats offensively. Danny Espinosa hit 20 HRs in 2016, nobody is saying he was valuable on offense. There is some good news, as he was quite effective on defense over the last few seasons. He left the Nats organization as an offense-only catcher, and over the last few years, especially since going to San Diego, he became a defense-first one. And I’m not talking about his missing offense, I’m talking about his development as a strong defensive catcher. He had a WAR of 1.0 this year, despite his terrible offense, because of his catching abilities. Everything Law said about the then 21-year old coming off his first season in High-A checks out, including that power. And he didn’t really lose the plate discipline, but his inability to hit fastballs in the zone means its not translating to walks. If he can’t recover, his value is very limited. Heck, it’s possible that by age 27 he was already done, and just can’t catch up to a fastball anymore. 27 years old would be quite young for this to happen, although it’s not outside the realm of possibility, it wouldn’t be the first time it happened to a good hitter. Another possibility is that it has to do with a lingering injury, or a swing that is messed up, or he was going through something and was mentally not with it, or any number of other excuses (I might suggest an eye exam…). If you’d like some wild injury speculation, Norris has battled numerous minor hand and shoulder injuries over the last few seasons which may have affected his swing, including an AC joint sprain in the middle of 2015. Whatever it is, the Nats know what they need to work on – getting him to hit a fastball. And Nats probably believe 2016 was something of a fluke, a bad season that was an anomaly rather than just what Norris is now. If they’re wrong, though, they didn’t give up much for him, so it’s a risk worth taking. The biggest problem will be when they recognize it and what they can do about it. But if they’re right, and can get him to hit fastballs again, they got a steal.